I finally found some time this past week to put in a little more effort on my current project, “Heart in Bloom.” Per usual, I find I’m changing the floss colors a bit as I go along, and am making some design adjustments to better suit my idea of balance. The actual chart is small, so the changes I am making won’t affect the overall size very much at all, and I doubt anyone but the designer would notice the revisions. I almost always find it hard to stitch a chart exactly as it is shown, I keep wanting to fiddle with it. I suppose that’s the graphic designer in me coming out. I get a lot of pleasure out of adapting what I see to make it better suit its recipient and my own sense of color. I’m glad that I chose a small design because the arthritis in my right hand has been slowing me down of late. 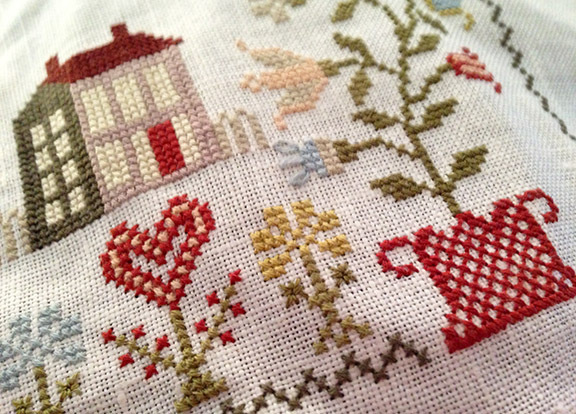 It sometimes prevents me from stitching entirely — gripping that little needle is an impossible challenge some days. However, my “wear and tear” arthritis is quite mild compared to that of several people I know. Most of the time I don’t even think about it, it’s only when I go to turn a key in a lock or button a shirt or grip the handle of a coffee cup that I am reminded that there are some little things I just can’t do as well as I used to be able to do. All I can say is that ibuprofen is my friend!